Detective Inspector Zigic and Detective Sergeant Ferreira of the Hate Crimes Unit have been called to a shed fire in a section of Peterborough that is dominated by recent immigrants. The house is owned and occupied by the Barlows, who failed to call the fire brigade, letting the shed burn to the ground. In the wreckage is the charred body of man. It’s assumed to be a Latvian national who’d been dossing there for a few weeks. The Barlows claim they had nothing to do with the fire, but their actions suggest otherwise. Zigic and Ferriera start to pursue two lines of investigation, the first into the fire and the second into the identity of the dead man. One path heads into the poor, white working class and British nationalism, the other into the underbelly of indentured immigrants working on farms and building sites and as waitresses and prostitutes. Meanwhile, Paolo, an immigrant from Portugal, has found himself working sixteen hour days on building sites and fearing for his life. 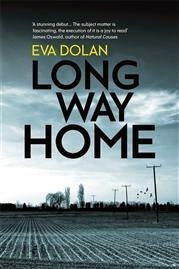 Long Way Home is the antithesis of the classic English cozy. Rather than the amateur detective solving a dastardly crime in some middle/upper-class idyll, Dolan presents the rotten underbelly of modern Britain -- everyday racism, anti-social behaviour, poverty, and exploitation -- investigated by a police force under resource constraints and media pressure, who are mistrusted and little respected. The story is set in Peterborough, a place where there is an uneasy relationship between locals and new immigrants, many of whom are indentured to gang bosses, are poorly treated, and are kept in line with the threat of violence. The tale itself focuses on the investigation into the torching of a shed in which an immigrant slept by Detectives Zigic and Ferreira. The former is a second generation immigrant who worries he’s not spending enough time with his wife and two boys, the latter a feisty, headstrong young woman with a chip on her shoulder, who moved to Britain when she was seven. The real strength of the book is the plot, which is a cleverly worked police procedural with a couple of nice twists and turns, and the contextualisation and gritty social realism with respect to working class neighbourhoods and the treatment of some immigrants to Britain. There’s are fine lines between hectoring, moralising tale and searing, gritty social realism, and between lived lives and criminal/immigrant stereotypes and caricatures. Dolan understands the difference, managing to find the right balances and letting the injustice and morals of the tale speak for themselves. Overall, a gritty, thoughtful read with a compelling plot. This book is on my radar and I hope to read it soon. 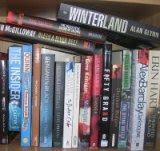 God knows when as I now have a TBR book case. But hopefully soon.